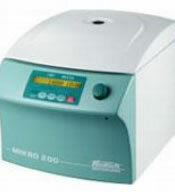 The Mikro 200 ranks amongst the fastest centrifuges in its class - with a maximum speed of 14,000 RPM and an RCF of 18,626. Best separation results are guaranteed with the smooth-running, high-performance motor featuring a maintenance-free frequency drive. With the autoclavable and aerosol-tight accessories, even infectious materials can be processed safely for both the user and the environment.